Crystalline lakes and spectacular sunsets provide an ideal setting for solitude, relaxation and recreation any time of the year. 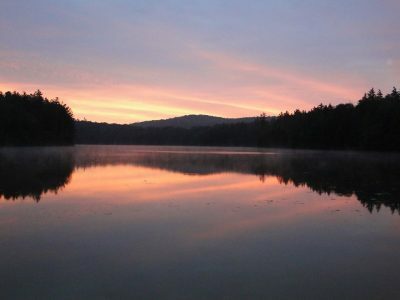 The lands of the Adirondack Forest Preserve surround Lapland Lake with its hundreds of carefully managed private acres. In this secluded mountain setting, cozy, comfortable surroundings and warm hospitality are reminiscent of Finland. Founded more than 38 years ago by U.S. Olympian Olavi Hirvonen and currently owned and operated by Paul and Kathy Zahray, this complete four-season Lapland Lake resort is the ultimate relaxation destination. In spring, summer and fall, Lapland Lake’s facilities are available exclusively to overnight guests, preserving the serene atmosphere our customers savor. Adirondack lodging is offered in ten immaculate and private tupas, housekeeping cottages, each with a fully-equipped kitchen containing a full size refrigerator-freezer, stove-oven-broiler, microwave, electric coffeemaker, toaster and all utensils, pots, pans and dishware. Each tupa has its own barbecue grill and fire pit and contains a living room, two, three or four bedrooms perfect for singles, couples or families, screened porch, bath with shower, electric heat, and cozy woodstove with complimentary wood and linens supplied. Secluded, pristine Woods Lake is a pleasant walk or bike ride from the tupas along a gentle gravel pathway that winds through the resort’s woodlands. 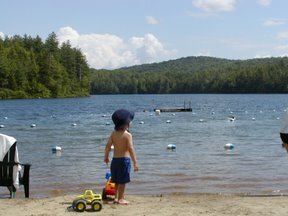 Children delight in the private, sandy beach, and parents take comfort in knowing there is a softly sloping lake bottom – a swimmer’s paradise! This virtually untouched 70-acre wilderness lake provides the perfect setting for lounging and soaking up the sun’s warmth. The absence of motorboats and jet skis ensures a completely tranquil environment – perfect for whiling away the hours with a good book or napping in our lakeside hammock. Hiking opportunities abound on our private 30+-mile trail system, 3-mile nature trail and adjacent protected state forestland. Sightings of white-tail deer, the majestic blue heron and hearing the haunting calls of our loons create unforgettable memories. The Benson Trailhead of the famed 133+ mile marked and mapped Northville-Lake Placid Trail is just off our property and offers an amazing wilderness experience for hikers. Canoe, kayak or row lazily, and perhaps fish for smallmouth bass, rainbow trout, bullhead, perch, pickerel, and brook trout. Enjoy a scenic bike ride, play a lawn game, indulge yourself with a visit to our Finnish woodburning sauna or with massage therapy. Enjoy an evening campfire – every tupa is provided with an outdoor fire pit. Take this opportunity to delight in quality time with one another. For those wishing to partake of motorized watercraft activities, there are several marinas on the nearby Great Sacandaga Lake that rent motorboats and pontoon boats. For those with their own power boats, the public boat launch on the Great Sacandaga Lake is a mere 9-mile drive. Fishing guides may be hired here – the Sacandaga Lake once held the world record for pike! We are fortunate to be within a 20-30 minute drive from several excellent restaurants, two of which offer lakefront dining on the Great Sacandaga Lake and another of which is located in the charming Village of Northville. Others, located within a 30-45 minute drive, offer options to enjoy splendid mountain views, a village setting or a 1700’s tavern rich in history. Two of these are owned and operated by graduates of the renowned Culinary Institute of America in Hyde Park, NY. Nearby attractions include horseback riding, river rafting, golfing, tennis and the lovely Lake George and Saratoga regions. Check out our regional calendar of events for wonderful activities! Enjoy the splendor of the Adirondacks enhanced by warm Finnish hospitality every season of the year at Lapland Lake Nordic Vacation Center!